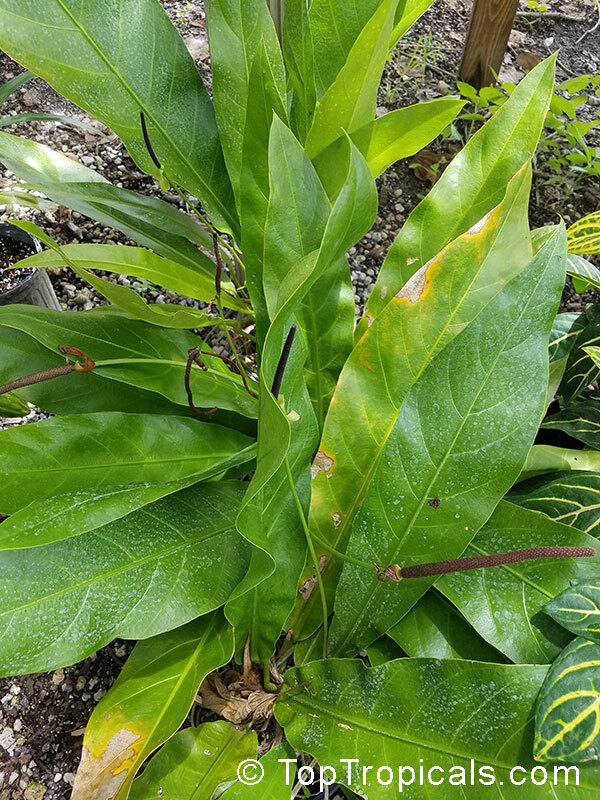 A wonderful addition to tropical plant collection, Anthurium crenatum is endemic the Dominican Republic, Puerto Rico, and Virgin Islands. It is somewhat similar to Anthurium hookeri. Described as a "typical plant of the Antillean humid forests", this species is occurs primarily in moist forest, growing on trees and rocks. It is usually found growing in clusters. Unlike most rainforest plants, Anthurium plowmanii can grow in extremely dry conditions and is often the only evergreen plant in some jungle areas during the dry season. 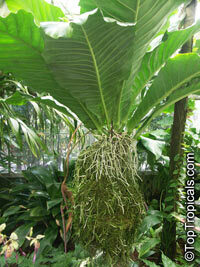 This makes it a great indoor plant where air humidity is low. Anthurium plowmanii is not difficult to grow provided you have the space. The species can become quite large. 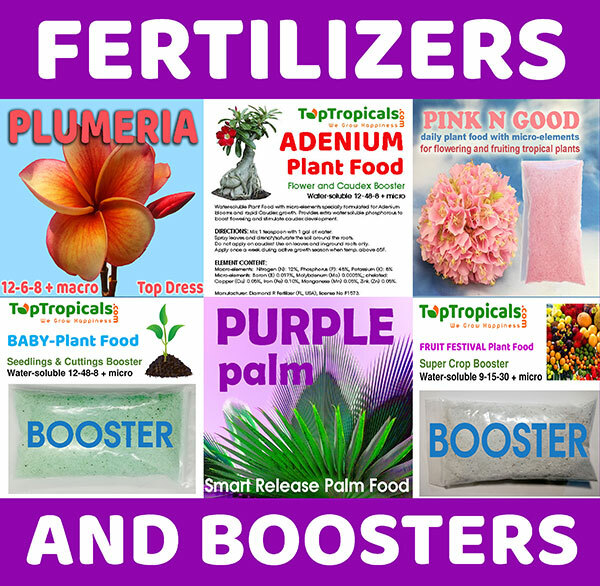 The soil mixture should contain peat, Perlite, and orchid potting media containing charcoal, bark and some rock. The plants can be grown in diffused light and is allowed to ocassionally dry. Giant Bird's nest anthurium. For those that love jungly plants. 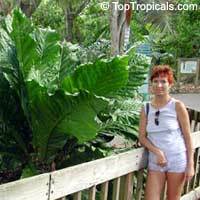 Their enormous wrinkly leaves have an almost cardboard like texture and grow to about 2ft. Used in places that have good natural light and lots of space. 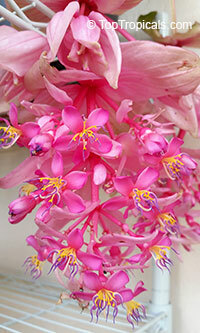 Bamboo ground orchid produces pinkish flowers at the top of tall cane-like pseudobulbs. It's the only species in the genus. The plants are quite tall; they'll reach at least hip level, possibly over your head, and their vegetative resemblance to bamboo can be uncanny. The long pseudobulbs have leaves alternating along their length, similar to Epidendrum orchids. The flower stems, which emerge from the top of the canes, produce several flowers sequentially, so that there will be one at a time over an extended period. 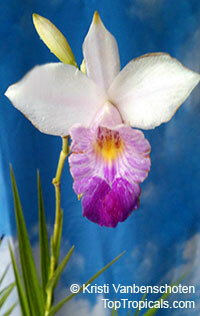 The flowers are white with a purple-to-pink lip, and shaped similarly to a Cattleya orchid flower. They are 2-3 inches across, and can appear for much of the year, especially in summer. Friendship Plant. 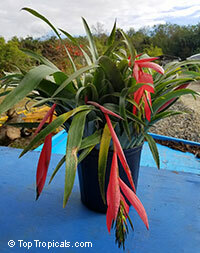 This Bromeliad is one of the easiest to grow indoors, and one of the most striking. Its thick, strap-like leaves grow into an upright rosette, creating an urn that must be filled with water at all times. As the plant matures, the leaves arch outward, lending a graceful appearance. 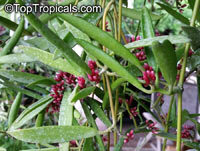 The foliage can reach up to 15 inches tall and about twice as wide, so give this plant some room to spread out. The flowers are pink, purple, yellow or green and are surrounded by red or pink bracts. One of its common names Queen's Tears comes from the drops of nectar that "weep" from the flowers when the plant is moved or touched. 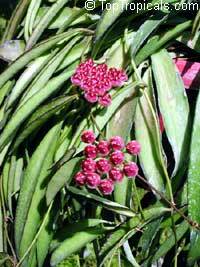 Because it readily produces offsets that can be shared with friends, it is also commonly known as Friendship Plant. Horny wonder, Bushman's pipe. Origin: South Africa. 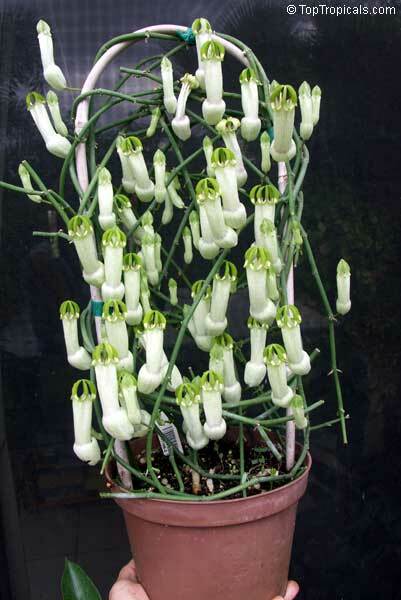 This is one of the most interesting plants you ever see. Nearly leafless rambling stems produce 3" inflated balloon-like flowers of white and yellow pin stripes, topped with emerald green birdcages. Anthony's Rick-Rack, Zig-Zag Cactus, Fishbone Orchid Cactus. It is nightblooming and its flowers last only a single night in spring. 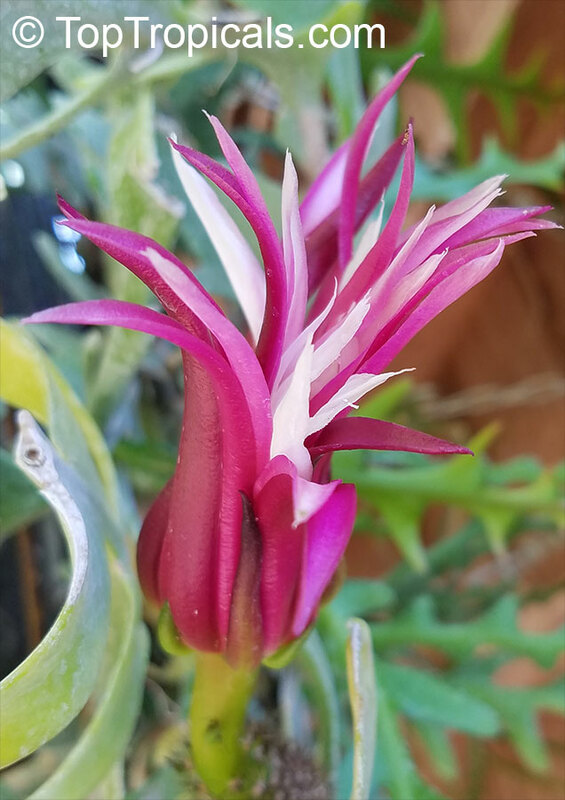 Because the flowers are so quickly spent, this epiphyte is mainly only grown for the strange leaves which lend it the common name Ric-Rac Cactus, or occasionally Zig-Zag or Fishbone Cactus. 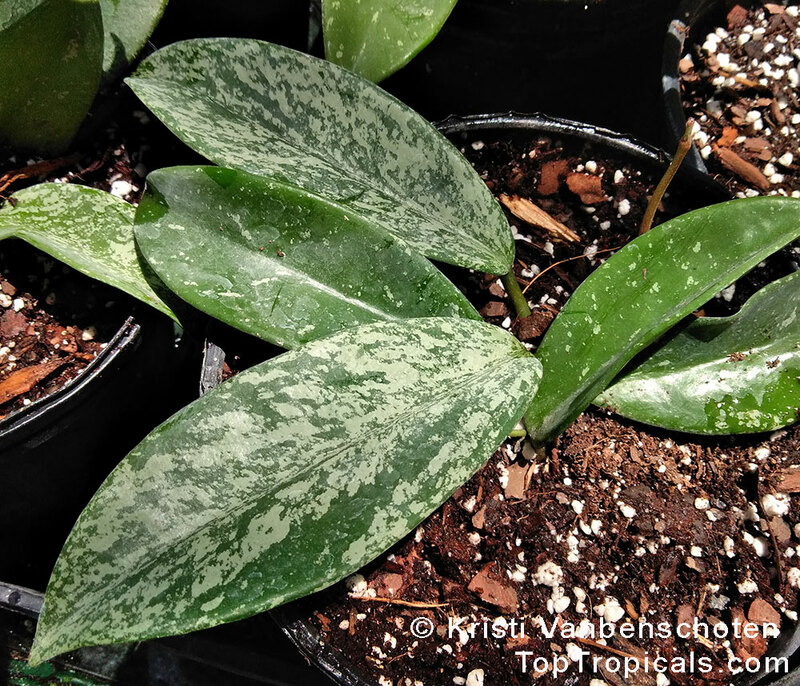 It can be grown either in orchid substrate, or in regular cactus potting soil with a bit of humus added. In the wild it attaches itself to trees, clinging by little aerial root filaments along the zigzagging succulent leaves, but is adaptable to terrestrial habits. It loves strong yet indirect lighting. It does not need a lot of water and should be permitted to dry out entirely between waterings. 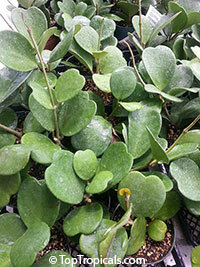 This is a very cute and unique plant from the Philippines and SE Asia that belongs to Hoya and Dischidia family. 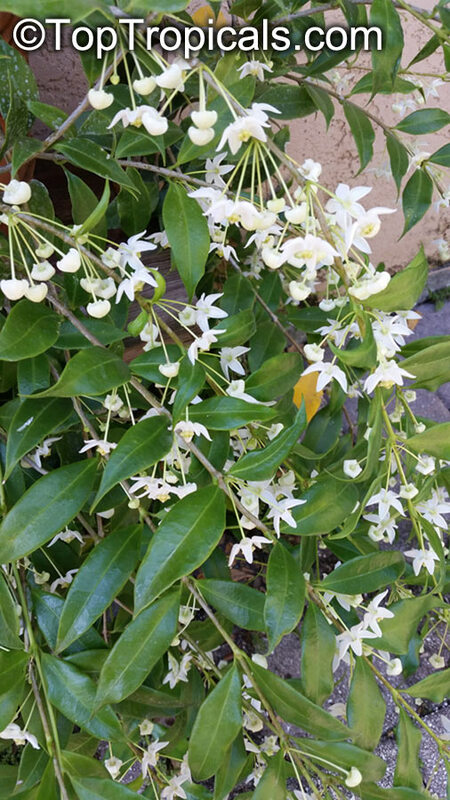 It's a vigorous growing vine with boat shaped leaves. Very easy to grow and it is a really good bloomer! A lot of Dischidias don't have the most showy flowers, but this plant has very cute fuchsia colored flowers, and the buds never fully open up! They look like little bulbs or dildos. Great as a house plant that doesn't need much maintenance. 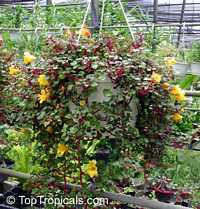 Grows well in hanging baskets in shade/filtered light and doesn't need a lot of water. 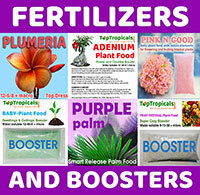 The potting soil should be very well drained and porous. 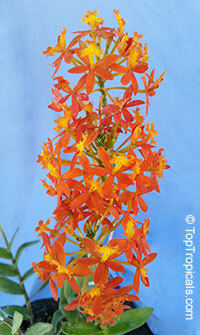 Epidendrum is a diverse neotropical genus that has flowers characterized by a frilly or fringed lip. This feature is occasionally diagnostic to distinguish between species. 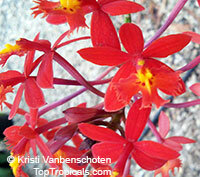 These orchids are widely cultivated and may be hybridized with Sophronitis, another South American genus. The flowers are usually small and delicately colored, and borne on a dense inflorescence. Many species have a fragrance. 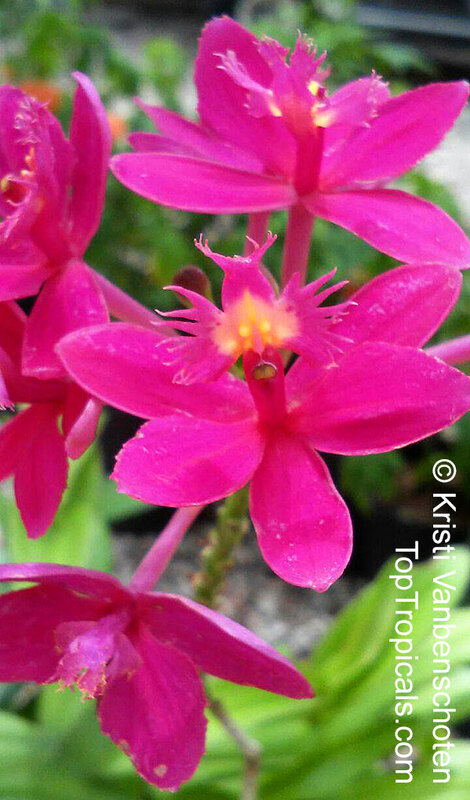 Epidendrum is a diverse neotropical genus that has flowers characterized by a frilly or fringed lip. This feature is occasionally diagnostic to distinguish between species. These orchids are widely cultivated and may be hybridized with Sophronitis, another South American genus. The flowers are usually small and delicately colored, and borne on a dense inflorescence. Many species have a fragrance. These well established plants are a red raspberry color. 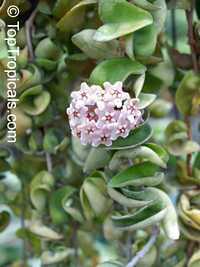 Wax Plant. Hoya carnosa does best in at least 4 hours of direct sunlight a day, but also can be grown in bright indirect or curtain-filtered sunlight. Water freely during flowering but allow the soil to become almost dry between waterings when the plants are resting. Do not remove the leafless spurs or stubs, on which new flowers appear every year. Wax Plant. Veriegated form with pink flowers. Hindu Rope, Krinkle Kurls. This variety has curious curled leaves. Very slow growing and showy. 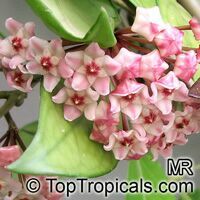 It's a hoya best suitable for growing as a hanging plant. The stringbean like leaves are very narrow, dark green and almost "bent" along the leaf. This is a cute set of two plants grown together in one pot - variegated and green-leaf Valentine hoyas. Heart-shaped rooted leaflets in one pot! A wonderful Love symbol of Togetherness of the Two. Sweetheart Plant makes an ideal houseplant. It has become increasingly popular in recent years. Unusual and quirky "heart" shape leaves appeal to anyone looking for that special novelty gift for their loved one or a plant enthusiast friend. Wax Hearts, Sweetheart Hoya, Valentine Hoya, Heart leaf. Hoya kerrii - Sweetheart Plant - makes an ideal houseplant. It has become increasingly popular in recent years. 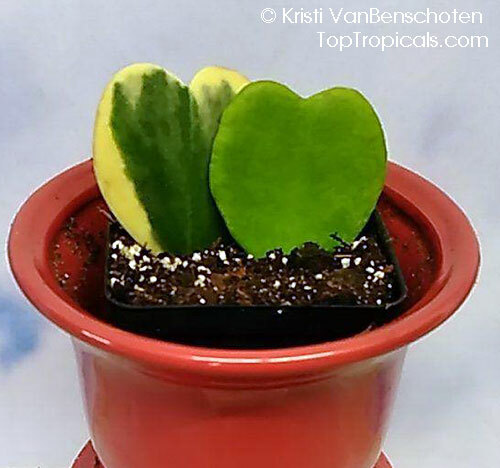 Unusual and quirky "heart" shape leaves appeal to anyone looking for that special novelty gift for their plant enthusiast friend. 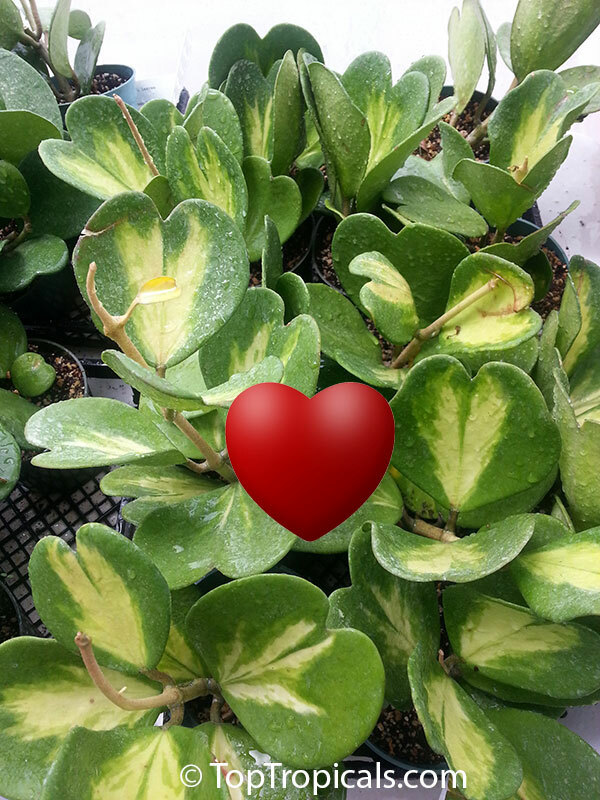 Variegated Wax Hearts, Sweetheart Hoya, Valentine Hoya, Heart leaf. 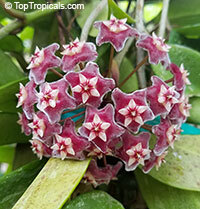 Hoya kerrii - Sweetheart Plant - makes an ideal houseplant. It has become increasingly popular in recent years. 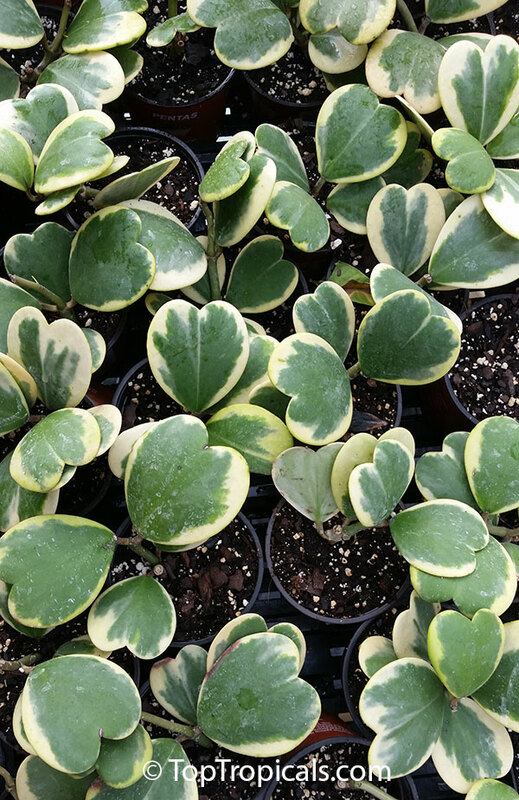 Unusual and quirky "heart" shape leaves appeal to anyone looking for that special novelty gift for their plant enthusiast friend. 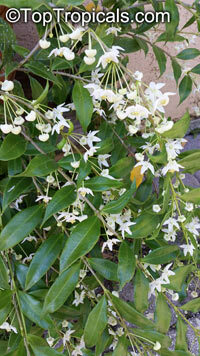 Flowers are wonderfully fragrant, have a crisp, clean, waxy appearance. Fragrance is somewhat citrus-like but sweet. The leaves are thin and beautifully copper coloured when young and the stems tend to have an upright habit until they begin to flex as they grow longer. This easy to grow species, it is truly spectacular when it produces its glorious colored flowers. A large number of H. pubicalyx cultivars are in cultivation, each displaying a different flower color or, occasionally leaf color. 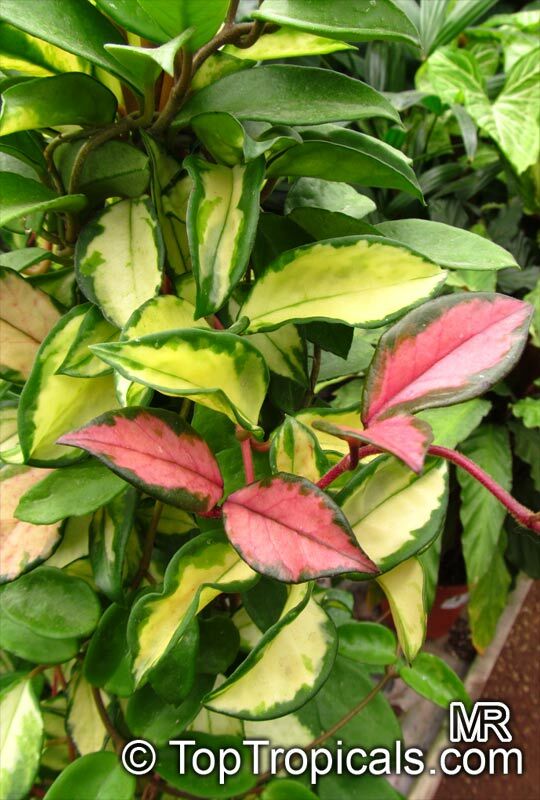 This variety has variegated leaves - see photo of the leaves. The plant gets its name from the furry rhizomes that grow on top of the soil and resemble a rabbit’s foot. 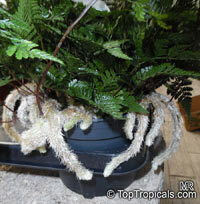 The rhizomes often grow over the side of the pot, adding an extra dimension to the plant. Functional as well as decorative, the rhizomes absorb moisture and nutrients as they crawl across the moist soil. Very exotic looking house plant or small specimen for your shade garden! This is a unique species of well-known Impatens, with showy yellow flowers and dward grwoth habit. It is an ideal hanging busket or a house plant! The plants are very fragile and some branches may break during shipping, however it grows back rapidly and readily. Cuttings root esily. We will provide the best packaging. 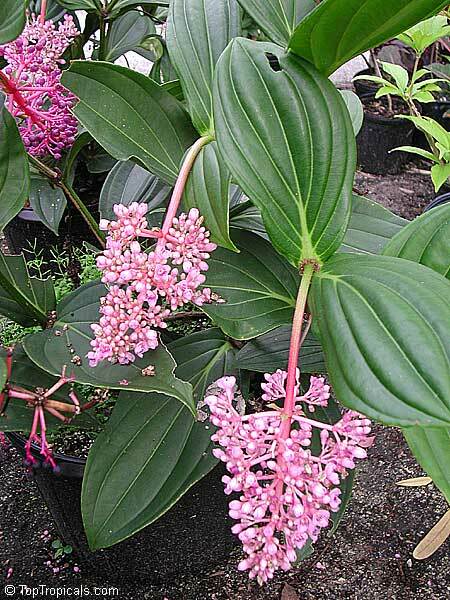 Medinilla has bright pink flowers and can be grown as a small shrub or a potted plant. 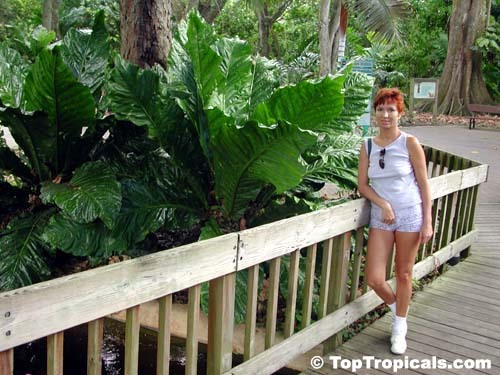 Very tropical-looking exotic plant. Leaves of this plant are very fragile and may be slightly damaged during transportation which does not hurt the plant. Trim as needed and more new leaves will grow quickly. Rare species, hard to find! 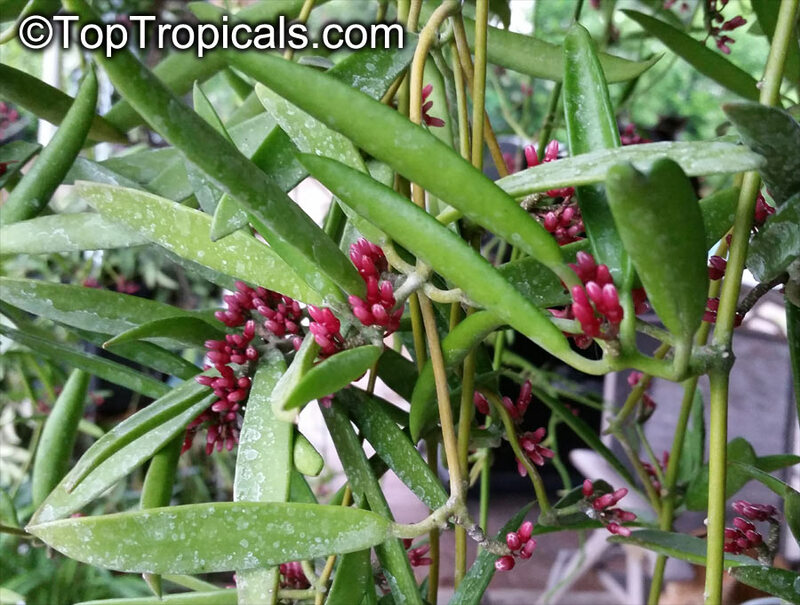 A beautiful tropical evergreen epiphytic shrub grown for its lush foliage and huge panicles of pink flowers. 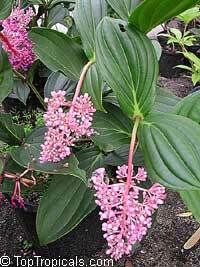 Plant in rich, moist, well-drained, humus-rich soil in part-shade. Water and feed well in the growing season. Propagate from seed or cuttings.